There are two “cruciate” ligaments in the knee; the anterior (ACL) and the posterior (PCL). These ligaments crisscross to give stability to the knee. Often times there will be a meniscus injury along with the ACL tear. 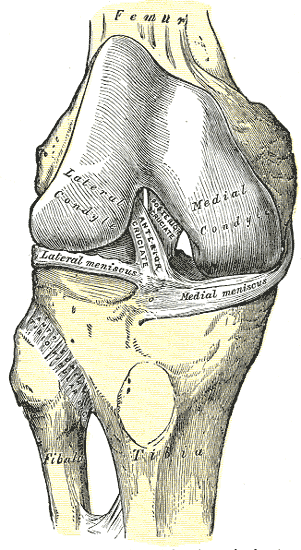 The ACL has several functions in the knee. It prevents the lower leg from moving forward on the upper leg, it prevents hyperextension on the knee, it help stabilize the knee in side to side movements (thus protecting the meniscus), and helps control the amount of rotation the lower leg has at the knee joint. The ACL is most commonly torn by a rapid change in direction (usually while running), stopping suddenly while running, or landing from a jump. The ACL can also be torn from an injury such as slipping on ice, impact during a car accident or having an object fall on the knee. Patients usually report hearing a “pop” and feel a sudden “giving way” sensation in the injured knee. Soon after, the knee begins to hurt and has noticeable swelling. MRI: will show if the ligament is torn or cartilage is damaged. Nonsurgical options may be used if the knee cartilage is undamaged, the knee proves to be stable during typical daily activities, and if the patient has no desire to ever again participate in high-risk activities (activities involving cutting, pivoting, or jumping). If the nonsurgical option is recommended, the doctor may recommend physical therapy, wearing a knee brace, or adapting some typical activities. If physical therapy is recommended it will be used to strengthen the muscles around the knee to compensate for the absence of a healthy ACL. Physical therapy will focus on strengthening muscles such as the hamstring, quadriceps, calf, hip, and ankle. This therapy will help to re-establish a full range of motion of the knee. With the use of these nonsurgical options a patient can expect to be back to normal daily activity within one month. However, most ACL-deficient athletes conclude that their knee continues to feel unstable, again confirming the important role of the ACL in normal knee stability. In addition there is a significant risk for developing an osteoarthritis over the years in an instable knee. Surgical options may be used if the knee gives way during typical daily activities, showing functional instability, or if the patient is unable to refrain from participating in high-risk activities ever again. Reconstructive surgery may also be recommended if there is damage to the meniscus (cartilage). This surgery is completed using arthroscopic techniques. There is also an option for an autograft to be done using a chosen tendon. There are, however, pros and cons to the surgical treatment, and consideration of possible complications must be thought through and discussed with your surgeon before proceeding with this form of treatment. If the surgical treatment is chosen there are also rehabilitation requirements. Physical therapy must be completed in three phases after the surgery is completed. With the use of the surgical treatment option, rehabilitation included, a patient can expect to be returning to previous and desired levels of activity in six to nine months. The final goal of physical therapy for a patient that has suffered an ACL tear is a return to as much function as possible; whether or not the patient has received surgical repair. For those patients that choose NOT to have surgery, PT will assist in decreasing pain and swelling, increasing range of motion (ROM) and strength and gradually re-introducing activities. When surgical repair is done, rehabilitation will take longer (average 3+ months) but the stages are the same: controlling pain and swelling in the knee, recovery of ROM and strength, and finally a graduated return to full activity. Strengthening exercises are a large component to either program and the physical therapist will make sure that these exercises are done safely and in the proper progression. In either case, therapy is extremely important to help maintain knee joint function and decrease the amount of degenerative wear and tear. 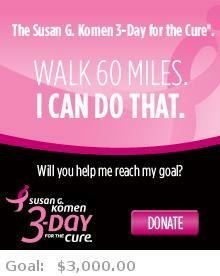 I am walking 60 miles to help cure breast cancer. What are you doing? Please consider a donation, it would be very much appreciated! Thank you.